Recipe: preheat oven at 180 degrees C.
1./ Put individual forms at least 1 hour in the fridge, than butter and sugar them carefully. This is delicate as it will definitely help your souffle to come up straight and even. 4./ mix egg yolks with sugar up to white and ad lemon zest. 6./ Mix slowly and delicately the egg yolks with the whites in smooth circular movements. And put in the forms. Swipe off till flat. 7./ sprinkle with ice sugar and flame until nice light brown. 8./ put in oven for 7 to 8 minutes. (Very important to know the heat of your oven and never open the oven prior ready). 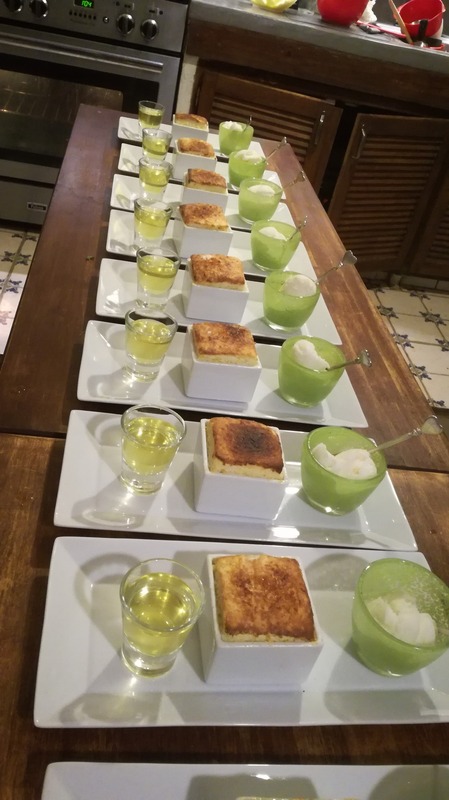 You can serve as is or do like me at B&B La Parare serve together with a nice lemon sorbet and the home made limoncello from Karin. (See picture).